Bombardier Transportation has announced it is participating in the Persontrafik exhibition. The show for the Nordic rail market will take place in Stockholm, Sweden, on 22–24 October. The transportation solutions provider will be located at stand C05:49. Bombardier is particularly proud to present its energy-saving MITRAC TC1500 propulsion solution and its new battery-powered hybrid electric train. There will also be a virtual reality exhibit showcasing Bombardier’s new metro train for the Swedish capital, the MOVIA C30. This metro train will run on the city’s Red line. Bombardier’s full range of solutions will be accessible via interactive touchscreens. “We are proud to present Bombardier’s latest innovations for sustainable mobility at the Persontrafik exhibition, including our ground-breaking BOMBARDIER MITRAC TC1500 propulsion solution and battery-operated electro-hybrid train. The MITRAC TC1500 (‘TC’ stands for ‘traction converter’), which was both designed and built in Sweden, will be showcased at the exhibition. Trials for this product, which features silicon carbide technology, were successfully completed on the MOVIA C20 metro train, which operates on Stockholm’s Green line, in March 2018. During the upcoming event Bombardier will give two seminars that will focus on zero-emissions trains for the Nordic region. Bombardier only recently unveiled its BOMBARDIER TALENT 3 electro-hybrid train, which is entirely emission-free and is fitted with MITRAC traction batteries. This battery will also be installed for the Nordic market in the BOMBARDIER ZEFIRO Express BEMU (battery-electric multiple unit). Bombardier is confident that by next year it will have extended the range of its battery-powered trains to 100km, allowing them to bridge greater stretches of non-electrified track. 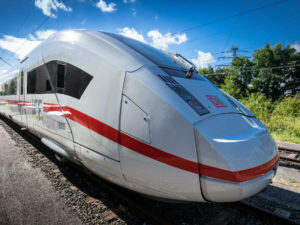 Bombardier Transportation will also team up with Trafikverket and Länstrafiken Jönköping to discuss how the recent decision to bring in high-speed trains will impact regional rail traffic.